Artiss YouTube Embed: The YouTube ID of FpZGHP2K7Ys is invalid. A mother would do anything for her daughter, and more than just something, Dayana Castillo has done everything for her daughter. Dayana has fought not only by his daughter Angie, but for all children in Panama who have Osteogenesis Imperfecta, a genetic disorder that causes bones are very fragile. Thanks to all your effort, Foundation was created Crystal Children, organization that unites all the families that are affected by OI. This foundation has served as a support group, as it has brought to all the families involved and has pushed the medical community to increase their efforts in the treatment of OI. "It started by Angie,"Says Dayana. "She is my princess courage." Angie began to show signs of the disease to-day-old. She cried for eight consecutive days. "La Banaba, took care, and she just kept crying,"Dayana account. "We did not know was happening to her." When Dayana and her husband, Alvin Nunez, llevaron a Angie al hospital, Doctors called the police, thought it was child abuse. After fighting his case and that the doctor reviews the X-ray, which revealed eight fractures, Angie finally was diagnosed with OI. "Every time something happens to me, My mom is very scary,"Says Angie. "I am very afraid if I've had to teach him to be brave." Being brave is quite difficult when one is broken and can not control when or how. From diagnosis, Dayana and Alvin have had to fight to get treatment for his daughter. "The doctor said she would continue fracturing,"Says Alvin. "There is no cure, and here in Panama, very few doctors know about the disease. " Dayana, Alvin, and Angie spent four years without any help. They went to different places and no one gave an answer about what was happening. "Those four years were very hard and sad,"Says Alvin. "Every time Angie was broken, was like going back to the beginning. " A breakthrough in the understanding of OI in the family was when they met a plaster technician at Children's Hospial. In one of the multiple fractures Angie, the technician began to teach them as casting Angie, and most importantly, what not to do when she has a fracture. A big test was when Angie broke the femur, already having the other leg in a cast. Dayana and Alvin were plastering the leg before running to the hospital to avoid any possible deformity. "Those four years made us grow,"Says Alvin. "Now when I get the opportunity to create the foundation and guide the first family, knew that. That family had a baby four months and did not dare to load it for fear that will break. " That knowledge about OI got bigger when they met Dr. Jorge Mejia. Finally they met a doctor willing to work with patients with OI as Angie. "All the doctors know about fractures,"Says Dayana. 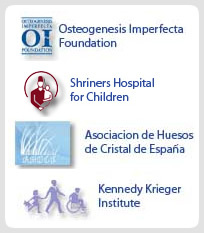 "Here in Panama we have great orthopedic, but when it comes to OI, which is a rare disease, do not know how to treat. That was the first mountain we had to cross. " Dayana and the foundation does not give up this mountain, but continued to fight even harder. Although the battle was made more difficult, more people were joining the cause. More and more cases have been found, and that's how you have noted. It was not easy. "Dr qe Mejia has been helped and guided us,"Says Alvin. "After meeting him, We have known other people who helped and guided us in creating an organization has, and we realized that this was all good, if we had this problem, Imagine how many other people have the same problem and does not know. " The medicine needed to treat OI, pamidronate, has not been accepted in Panama. This medicine helps the body make collagen, the protein that makes bones stronger and prevents fractures. Without this medicine, patients are more likely to have a fracture, and you can treat the fracture, but not the disease. Those who can afford, which is almost none of the patients, go to other countries like the United States and the Dominican Republic, where they receive treatment. Dayana, Dr. Mejia, and others are fighting to bring medicine to Panama, and this is accepted by the government there, to make it more accessible to all patients with OI. The foundation has done everything possible to bring medicine to Panama, but still have faced considerable resistance from the authorities. "We have a number of problems facing unfair,"Says Dayana. "I justified each of these excuses that we are in a legal. We have said it is an experimental drug, which is not true as it is approved in the U.S., Europe, and the Dominican Republic. Why Panama has to be isolated from these countries? I justified all, and still think there is a lack of interest and understanding by the people I have to convince to bring medicine. " Fortunately, The foundation has called the attention of different public organizations such as the Panama Police Department. "My husband works for the police,"Dayana account. “Investigamos, and we realized that within the police there are six other cases. At this point, the police chief gives full support to the foundation. " Since awareness in the population is something important for the foundation, The police have been a great help for touring, raise funds, and organize activities. Besides being a great support for raising awareness, the foundation needed to prove to the authorities the efficacy of treatment for OI. Angie has been the champion of the cause, and has received great support from the Police Department. Every three months, Angie travels to the Dominican Republic and the police department to help defray travel expenses. Angie began treatment at age six unable to walk. After receiving treatment for the first time, Angie began to walk. It was a miracle for the Nunez family, as for the foundation. The main mode of transport Angie remains his wheelchair, but after a little over a year of treatment, improvement in it has been a tremendous thing. "It breaks my heart every time he says Angie, ‘Mami, I want to go play outside, I drive a bicycle or tricycle "and I have to say, ‘amor, can not,'"Says Dayana. "She always tells me, ‘porfa, even a little bit. " Knowing that early treatment can help is what keeps me strong; that, and know that all these kids want the same. " Angie and can do a couple of these things, but rather carefully. She is proof that treatment works. "You can say that Angie is the center of our family,"Says Alvin. "She is what keeps us strong. When we're a little sick, she always says, 'Do not worry, you'll be fine. If I give you a kiss, you will feel a little better. " She is what motivates us to move forward. " Nunez's family comes to bringing normal life can be. They carry a pretty normal day to day, Angie and brother, Joshua, helps a lot to take care of Angie. "Sometimes it tells Joshua, 'I have fear of sleeping alone,'"Says Alvin. "If Joshua comes and tells me 'Papi, Angie is afraid, Can I sleep I can sleep here or there? 'And give permission. That's how. We try to be as normal as we can. " "If you Dayana closes a door, she keeps playing until you open ten more,"Says Alvin. "And if three of those doors are closed, keep looking until you get twenty doors where you can go to play. " The Battle of Dayana is a rather difficult, but he knows it to help his beautiful daughter, like all other children who face daily challenges of living with OI. "Dayana is a persistent woman,"Geovanni says Magan, the nurses Dayana en la Fundación. "She knows what she wants, what is best for these children. She is also a great friend. I admire a lot because it is fighting to get the medicine here in Panama, and we all want that. " Angie needs to continue receiving pamidronate to maintain quality of life you have now, Dayana and Alvin and hope that if she helps other children receive treatment. It's really a battle against ignorance and inflexibility of the government for the Crystal Children Foundation, but will continue to fight. "These children are the ones that keep me fighting,"Says Dayana. "Knowing who suffer from both, but can stop suffering is what keeps me fighting; them happy, running, being normal children, and they enjoy like everyone else. "